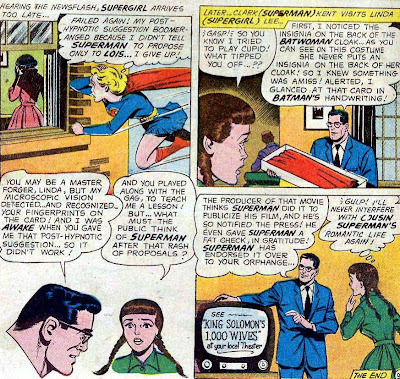 Here's a little story about a time where Supergirl gets tired of living in an orphanage and resorts to drastic measures in hopes that she can get the hell out of there. 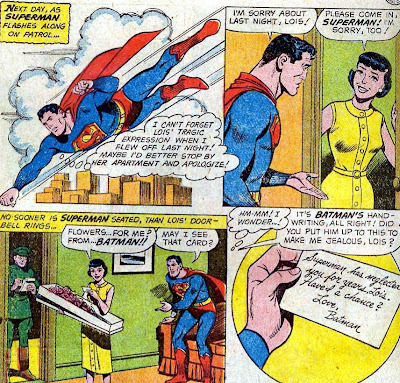 It's from Superman's Girlfriend Lois Lane #14 (1960). 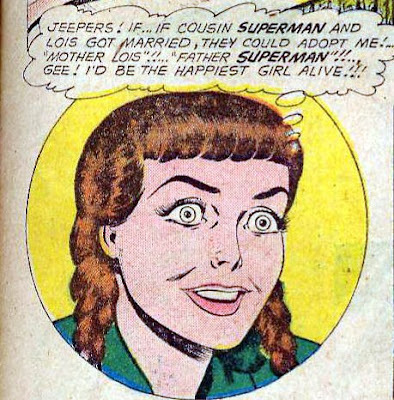 Oh, calm down Lois. It's Superman. What's he going to do? Take all those waterskiiers back to his tour bus after the show? How often does Supergirl spy on Lois? Aaahh!! Those eyes! They will haunt me forever! Ahahahaha! A coffee pot! 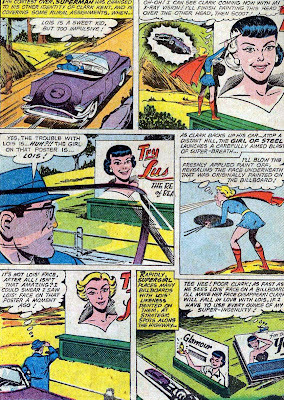 Nice one, Supergirl! 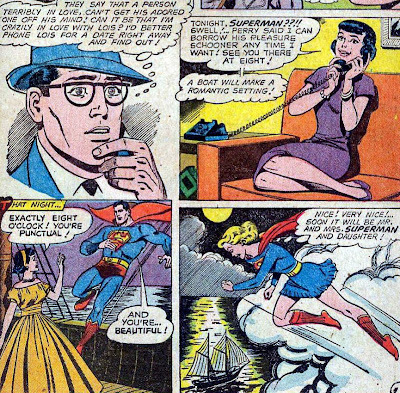 So Superman decides that he might possibly be in love with Lois. Which I never thought was the issue. I thought he just didn't want to put her in danger so he never acted on his feelings. Right? "Perry said I could borrow his pleasure schooner any time I want." Good lord! Look at the size of Perry's pleasure schooner! How much does the editor of the Daily Planet make?! Those are some unorthodox cooking classes they are teaching at the Midvale Orphanage. Holy crap, Lois! Do you want to date Superman or not? Because sometimes Superman has to go save lives, alright? What?! No! Ok, look Superman. It's one thing to suddenly decide not to propose to a lady, but you should NOT tell her that you were just about to propose but decided not to because she fell in the water. That's just cold. 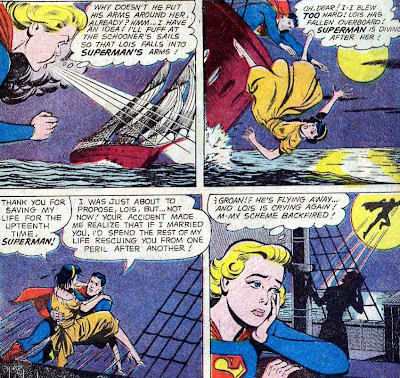 As is flying away suddenly, leaving Lois alone on a boat. I have to say, this is bold for Supergirl. Especially since she hasn't actually met Batman yet. At least not that we've seen. No! If anyone is going to be his Bat-Queen it's going to be me!!! Ohhhhh dear. Now you've done it, Supergirl. 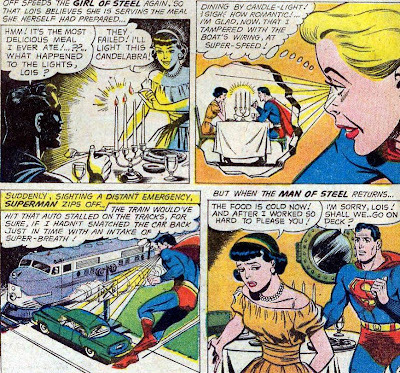 "I'll never interfere with Cousin Superman's romantic life again!" 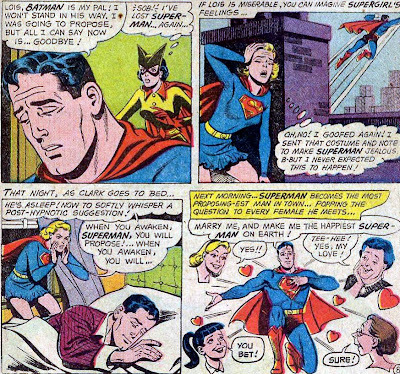 Well, at least not until your next appearance, when Superman makes you pretend to be his fiance. And it is just as creepy as it sounds. But I already talked about that story way back here.